Ring News 24Boxing NewsCan Mikey Garcia Still Achieve His Dream Of Becoming A 5 Weight Champion? 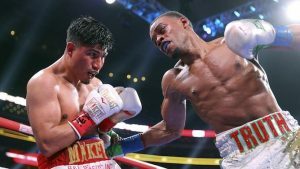 Last weekend, the truth for Mikey Garcia hit home when he emphatically lost in his world championship challenge to Errol Spence Jr by a unanimous decision at the AT&T Stadium in Arlington. The fight was relatively close up until the 5th round when Spence started to take over, showing his superior punching power, speed and general ring craft. Despite gallantly fighting on until the end, the Californian could not get himself back into the contest and had to face reality, as his attempt to be a five weight champion came crashing down. But despite what occurred last weekend, Garcia has stated that he wishes to attempt that same mission once again! “I think I’m going to achieve a fifth divisional title. I’m going to be a champion in that division (welterweight}. I’m resting. And in a week or two I’m going to plan my future. Something more comfortable,” Garcia told ESPN Deportes. So, can he do it? I would not doubt it! Physically, Garcia would be at a disadvantage against all of the current champions, but some more so than others. However, it is not just about physicality. Mental strength, experience and fighting styles matter. Looking back on the fight on Saturday with Errol Spence, it is now quite clear that Garcia did not carry the weight up correctly. He looked quite soft around the middle and seemed sluggish. The same thing happened to Juan Manuel Marquez when he fought Floyd Mayweather back in 2009. Not that I think he would have stood a chance against the modern legend anyway, but he looked ponderous and carried a fair amount of excess fat which probably affected his performance more than it should have. So, half the battle for Mikey will be to add the extra weight in the right way. 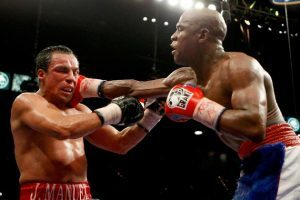 Juan Manuel Marquez looked fleshy in his fight with Floyd Mayweather in 2009. 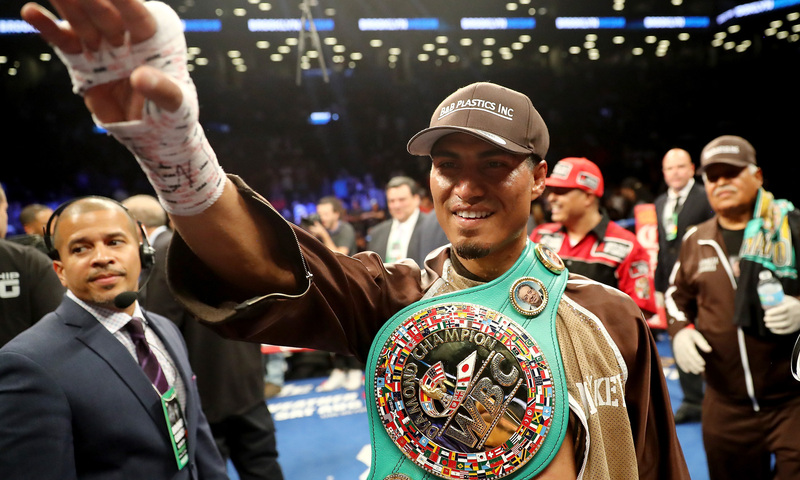 Realistically, the current champions that he will have the best shot at beating are probably Shawn Porter, Manny Pacquiao and perhaps even Keith Thurman, if his last lacklustre showing against Josesito Lopez is anything to go by. It definitely came across as if “One Time” has lost a step or two. It does look like Pacquiao could be fighting Errol Spence next, but if that does not come off then Garcia’s counter punching, left hook and jab could be a bit much for the Filipino at this point in his career, should they ever come face to face. Shawn Porter has a lot of fundamental flaws, even though he approached fighting Danny Garcia as technically as he possibly could. But he often looked a little clueless in terms of what to do for certain periods of that fight. That is because he tried doing something that simply does not come naturally to him. Porter is generally a little too wild and tries extremely hard to go for the knockout, neglecting the things that could make knockouts come more organically. This is where Garcia is superior. He is the much better ring technician and I predict he would have enough to outbox him, perhaps to a late stoppage or by a comfortable unanimous decision. But if there is ever another man that Garcia should avoid if he wants to be successful in his quest, then that would be Terence Crawford. 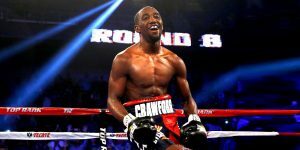 Both are great boxers, but Crawford has the better footwork, accuracy, hand speed and ring IQ. It would just be too dangerous a fight but one which would definitely catapult Garcia’s legacy, should he take it and unexpectedly win. The 31 year old still has plenty of time left on his side, and even though he faced his first conclusive loss recently, he can take comfort in the fact that there is still hope!